Moisturizers worth their weight in water from Vichy, For Beloved One and Estée Edit! Vichy Aqualia Thermal Mineral Water Gel - 50ml - $39.95 - a 48h, oil-free moisturizer with a light gel texture that offers instant refreshing effects and immediate comfort. Concentrated with Vichy Thermal Spa Water and enriched with hyaluronic acid to hydrate and make the skin more resistant to daily aggressions. As well as Aquabioryl - an active ingredient that is ultra-moisturizing and amplifies the feelings of comfort, softness and soothes during and after application. Available now at drugstores across Canada and online at www.vichy.ca. For Beloved One Hyaluronic Acid Tri-Molecules Moisturizing Surge Cream - 30ml - $95 - an extremely light daily moisturizer with a unique texture that turns into micro-water molecules when put into contact with the skin giving it a fresh, lightweight texture that keeps skin hydrated for 24 hours without feeling greasy.Contains malachite - which energizes skin by locking in moisture and preventing dehydration and exo-H - to stimulate the formation of hyaluronic acid in skin to keep skin moisturized and firm while utilizing Water-Activating Circulation Technology to instantly capture, replenish and create moisture and maintain healthy skin. Available at T&T supermarkets nationwide or online at yesstyle.ca. 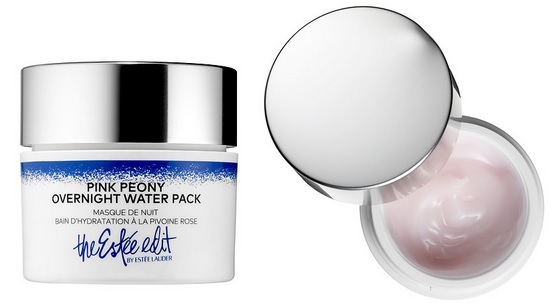 The Estée Edit Pink Peony Overnight Water Pack - 50ml - $58 - features a water-gel formula that delivers a power-packed punch of glow and hydration while you sleep. Enriched with pink peony, gogi berry, blueberry and cranberry to soothe, smooth and brighten skin while hyaluronic acid hydrates. Its quick-absorbing gel glides effortlessly over skin, leaving skin radiant and baby-soft - use it as a daily overnight treatment or anytime as a hydrating and energizing mask - a layer of this is especially great after a day outside in the hot summer sun, just leave it on for10 minutes and skin feels perfect!